Along with the medieval Hardegg Castle in Hardegsen, in the picturesque region of Lower Saxony in Germany, another castle in Austria bears that name. Hardegg Castle is the most interesting sight of the eponymous Austrian city located near Hollabrunn, in Lower Austria. The city is situated on the river Thaya on the border with the Czech Republic. The far North region of Lower Austria boasts exceptional natural beauty and relaxed lifestyle of the locals. Although unpopular as a tourist destination, the area around Hardegg Castle is well known to the Austrians, many of them living in the capital Vienna like to spend their weekends days in the peaceful foliage of old towns like Hardeg and Drosendorf. These villages are worth visiting because of historical and cultural aspects. Many historical monuments, led by Castle Hardegg are among the treasures of Austrian culture. Mighty medieval Hardegg Castle is the most important feature of the city. Over time the village grew around the hill on which the castle was erected. 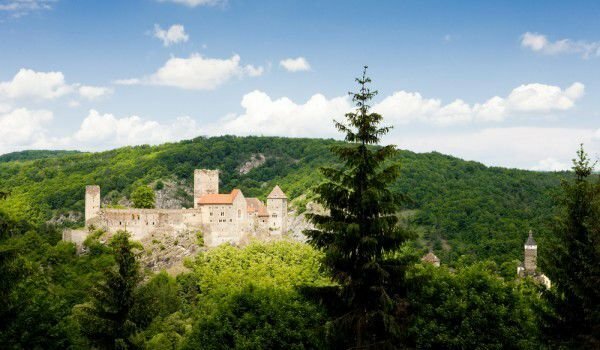 Originally built in the 11th century, the Hardegg Castle largely lost its meaning when Bohemia became part of the Habsburg empire. After this time the castle fell into being inoperable. Salvation comes in the person of Count Johann-Carl of Khevenhüller-Metsch. His family is among the most important noble families who were loyal to the Habsburgs in many cases. The closest friend of Karl-Johan such as the Habsburg Archduke Maximilian, brother of Emperor Franz Joseph I. Today in the halls of the castle Hardegg is a museum which tells mainly about the life of the Earl, and the decision that caused his violent death. Johann Karl agreed to become French emperor of Mexico, but Mexicans had no idea about it. Ultimately, the Earl was shot by a sniper. The exposition in the Hardegg Castle, tourists can see a copy of his head. The historical center of Hardegg is no less interesting. Near Hardegg is Riegersburg Castle, which should not be confused, however with the one bearing the same name and located in Styria. Today, tourists are offered a double ticket, which applies to the Hardegg Castle and Riegesburg.